at 800 Embassy Drive, Austin. The development was completed in 2018. Sales for available units range in price from $325,000 to over $975,000. Tyndall at Robertson Hill has a total of 176 units. Sizes range from 571 to 1736 square feet. 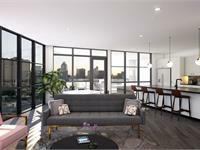 The Tyndall at Robertson Hill, the latest urban condominium community from Momark Development, reflects the dynamic spirit of Austin. Sitting atop Robertson Hill, The Tyndall joins a revival of the vibrant east side and embodies a genuine Austin aesthetic: modern, creative, and welcoming. Each home is flooded with natural light from floor-to-ceiling windows that let in views of the city from every angle. The Tyndall celebrates community through 23,000 square feet of premium amenity space: from a resort-style lounge pool, to a rooftop dog park, to a state-of-the-art fitness center overlooking downtown. Experience true urban living at The Tyndall, walking distance from Austin’s best dining, shopping, and entertainment. Sales office is by appointment only. Your inquiry will be delivered to the Tyndall at Robertson Hill sales team, who will send you more information about this development.